Home News What’s up with the new WatCard? What’s up with the new WatCard? 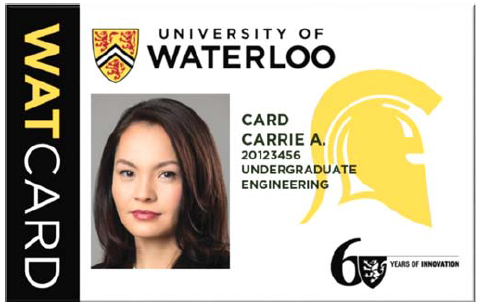 Back in August, the university released a new and intuitive version of the WatCard for all of your university identification needs. The new WatCard sports some security features such as a shiny watermark hidden in embedded foil that reveals itself when angled correctly, similar to your average twenty-dollar bill. This eliminates the possibility of fake cards being used around campus that has been a concern for some time. The new WatCards also come with a convenient contactless technology that allows students to just tap their cards when they require a service such as paying for food or using a uPrint station. The largest concern for some is the tap feature becoming compatible on buses, with the card being verified right on the spot. This means that part-time students can no longer sneak their way on to the bus without their student card getting declined by the system. Full-time students who pay the U-Pass fee may be thankful for this new insurance that they are no longer paying on someone else’s behalf. Part-time students who take the bus daily, on the other hand, now have extra expenses to take on. The transition to tap cards is expected to be fully completed by mid-2018 due to some students being “out of the community for the fall or winter terms” and up until then, the GRT will manually validate cards. Other small changes include the library barcode relocating to the back of the card along with the signature being digitally printed on. University staff will also receive an improvement with their WatCards adopting a sleek, vertical design that doubles as an ID badge the faculty have been requesting. Residences, retailers, and other special access areas for students are beginning to install contactless readers to fully take advantage of the WatCard’s new attributes.